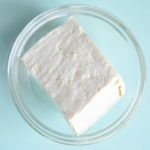 Tofu is a type of cheese made from soy. I don’t use it much because, in general, I avoid soy unless it is fermented. But it is a good protein source for an occasional meal, such as during the pre-fast for a 7-day Juice Fast. Just be sure to use Organic tofu, because commercially-grown soy is GMO. Or make your own from Organic soy beans (links to instructions included). The EssentiaList: Making Cheese and Tofu (pdf) to make your own soy milk and tofu! The EssentiaList: How to Make a Cheese/Tofu Press, as you will need the press for your homemade tofu. This vegan recipe is adapted from Fine Cooking; originally by Ivy Manning (1). The original serves 4, but I’ve reduced this to 2 servings. Be sure to use Organic Tofu. For the veggie oil, avoid soy or canola; I recommend using coconut oil for Asian authenticity. Or you could use olive oil. I wasn’t aware of this (because I’m not a vegetarian), but some curry paste contains shrimp paste, so be sure to read the label if you want to be truly vegan/vegetarian. Wild lime leaves are part of the original recipe, but it’s impossible to find these in rural Montana. You can buy Kaffir Lime Leaves on Amazon (2) if you want to be authentic; you’ll need 3 leaves for this half-recipe. Gourmet Sleuth (3) recommends 1 Tbsp lime zest as a substitute for 6 lime leaves. And I like to add a small handful of baby spinach leaves at the very end of the cooking, just to wilt them. Similarly, Thai basil is hard to find here; use regular basil as a substitute. I highly recommend prepping all the veggies and tofu before you begin cooking, as the cooking goes quickly! * NOTE: If you are using real lime leaves (3), you do not need the zest. Prep: Wash & trim peas; wash, de-seed, then slice red pepper into thin 2″-long strips; slice shallot thinly, grate lime zest, then squeeze the juice. Wash & pat dry the basil and spinach, if using. Tear into thin strips. Cut tofu into 3/4″ cubes. Cook: Heat oil in saucepan over medium-high heat until shimmering hot. Add curry paste and cook, stirring frequently, until fragrant, about 20 seconds. Reduce heat to medium; remove pan from heat and stir in snap peas, bell pepper, shallots, coconut milk, lime leaves or zest, Rapadura and 1 cup filtered water. Stir to combine. Add tofu and bring to simmer over medium heat. Then cover and cook until veggies are tender, 8 10 minutes. Stir in basil, spinach, Tamari and lime juice. Rest off-heat for 5 minutes. Adjust seasoning with salt. Serve over steamed brown Basamati or Jasmine rice; or steamed wild rice. This entry was posted in Citrus, Equipment, Fat or oil, Herbs, Leafy Veggie, Nut Milk, Onion family, Sauteed, Simmered, Spices, Sweetener, Vine veggies and tagged basil, bell pepper, coconut milk, coconut oil, lime, shallot, snap peas, snow peas, spinach, tamari soy sauce, thai curry paste, tofu. Bookmark the permalink.